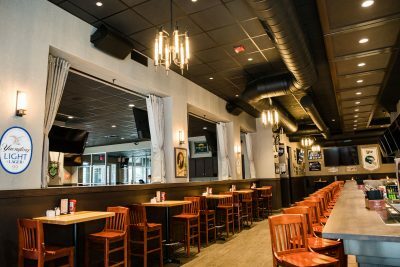 Located on the College of New Jersey campus, Landmark Americana Tap and Grill was designed as a casual restaurant and sports bar that also features nightly entertainment. Having opened in October, 2018 within the campus town center, the local eatery has been a central location for locals, college students and sports fans ever since. There is an abundant amount of television above the bar and throughout the restaurant, making it a sports fan’s favorite hangout. Diners can charge their cell phones within the plentiful amount of charging stations installed on the underside the entire perimeter of the bar. Served fresh from the kitchen, diners enjoy lite fare including tacos, sandwiches, finger foods, buffalo wings and tenders and more. 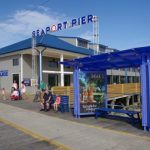 The restaurant can accommodate larger crowds for special events including birthday and graduation parties, fundraising and other private events. This is the third restaurant project Lighthouse Architecture has designed for Landmark Americana. The first two are Landmark Americana-Glassboro NJ, near the Rowan University campus and Urban Village Brewing Company, located in the popular Northern Liberties section of Philadelphia, Pa.